Indie folk favorites The Lumineers, Borns & Rayland Baxter are bringing their sensational music to the stage of the Greek Theatre Berkeley on Thursday 6th October 2016! The Lumineers are known for their massive hit track “Ho Hey” along with "Stubbon Love" "Flowers In Your Hair" and "Ophelia." Their hugely successful debut album has been certified Platinum in the US and Ireland, with Gold certifications in the UK, Australia and Canada. Don't miss your chance to catch them LIVE this Fall! The two founding members and songwriters of folk rock band the Lumineers are Wesley Schultz (lead vocals, guitar) and Jeremiah Fraites (drums, percussion). The do began writing and performing together to cope with the loss of Fraites' older brother, who was also Schultz's best friend, after he died of a drug overdose in 2002, aged 19. Originally based in New York, they struggled to progress as a band in the way they'd hoped, so decided to relocate to Denver, Colorado in 2009. 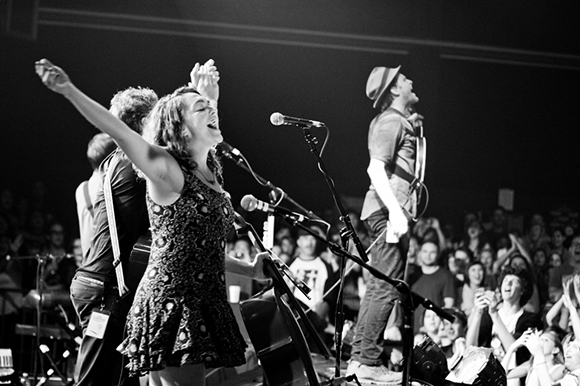 Cellist and vocalist Neyla Pekarek joined the band in 2010, after responding to a Craigslist ad. In the spring of 2011, they signed a management deal with Onto Entertainment, which funded the band to record a full length album. The band's song “Ho Hey” (which went on to become their first single) was used in the season finale of CW's Hart of Dixie in December 2011, which lead to the band signing a deal with independent label Dualtone Records (having passed up several major labels) just one month later.